The account describes itself in the Bavarian dialect with the slogan ‘And here I am at home’. On Twitter, Franz Münchinger, the main character of the well-known Bavarian TV series Monaco Franze lives on. Here, however, he does not wallow in the Munich lifestyle of the 80s. His account specialises in disseminating the political views of the AfD politicians Jörg Meuthen and Alice Weidel and of the AfD Bavaria. 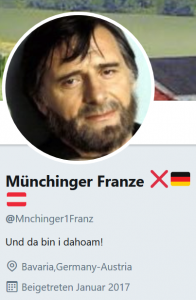 “Münchinger Franze” tweets against Islam, immigrants and refugees. In this way, he has accumulated over 10,000 tweets and has distributed 13,000 likes since January 2017, making him only one of a number of highly active, Bavaria-related Twitter accounts advocating for the cause of the far-right political party AfD with all their strength. ‘Rosi’also falls into this category. Instead of including a biography, the anonymous account describes itself only with a quotation by the Munich comedian Karl Valentin. 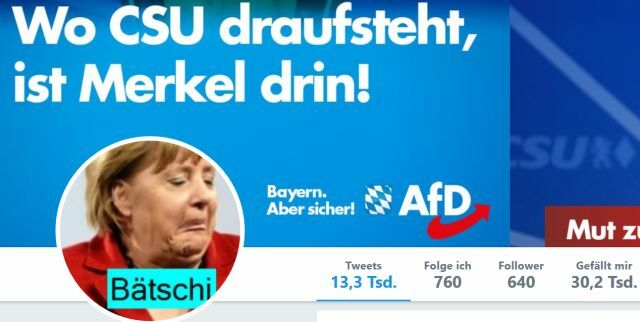 During the four months of its existence, the account has already managed to like 10,000 tweets, mostly comments of users who have turned against Angela Merkel; the parties CSU, SPD or the Greens; and those who support the AfD. Sometimes ‘Rosi’ also tweets herself. For instance, on August 27, she attributed an incorrect statement on refugee crime to the Green party politician Margarete Bause. 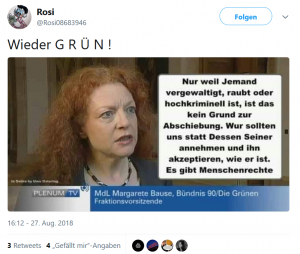 Only those who look closely, however, notice that the image is not her own ‘creation’; instead, it bears the signature of the meme producer Uwe Ostertag, who, among others, has been sentenced for incitement of the people in 2017. The AfD supporter accounts cover several Bavarian target groups and regions, even though their attributes are overly simplistic. For example, Günter (@BayernGG1981), a true FC Bayern fan, repeatedly shares German and some English texts from right-wing websites and regularly calls to vote for AfD. 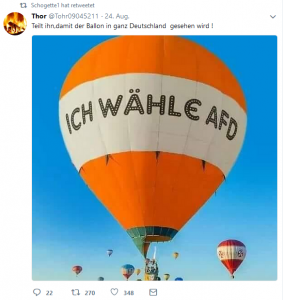 ‘Share it, so that it will be seen everywhere in Germany.’ The writing on the balloon reads: ‘I vote for AfD’. An account acting under the slogan ‘My Christian heart beats white-blue for Bavaria’ (@hefdie) describes him or herself as a master craftsman, and on August 29, 2018, retweeted no less than 22 right-wing posts within half an hour, many of them about the events in Chemnitz. ‘Schogette1’ from Munich, on the contrary, insists in his or her Twitter-biography to be ‘no church member!! !’, to miss the German mark and to oppose the European Union. And finally, there is ‘Markus der Bayer’ (Markus, the Bavarian, @DieBajuwaren). His profile picture could have been an idyllic family portrait, if it were not for the rifle over the father’s shoulder and the mother holding a cake with the inscription ‘AfD’. He, too, regularly retweets AfD content. ‘We have reviewed your report and found that there was no violation of the Twitter rules or laws.’ Reports against the account @ThomasReichelHB did not prove successful. From the user’s point of view, taking action against such allusions to violence and racism has limited prospects of success. Only around 10% of all Twitter complaints are successful, often because the reported posts do not contain content that is clearly punishable by law. 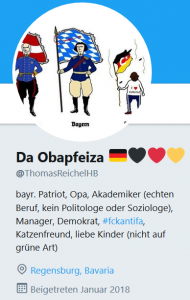 The consequence is that a highly active, AfD-related account like ‘Da Obapfeiza’ – according to its description, a ‘Bavarian patriot’ and ‘grandpa’ – remains online despite repeated complaints against it. And his racist profile picture stays, too. 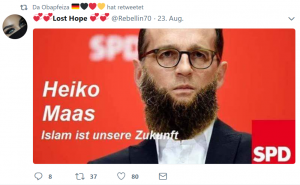 In the week after a user unsuccessfully requested that the account be taken down, he retweeted an islamophobic image manipulation purporting to be an election advertising the social democratic party SPD. Could the accounts have an effect on the Bavarian election? However, the concern that anonymous AfD supporter accounts might directly influence the results of the Bavarian election is currently unfounded. Despite being highly active – some retweet every few minutes – the accounts that we examined do not have a high number of followers. 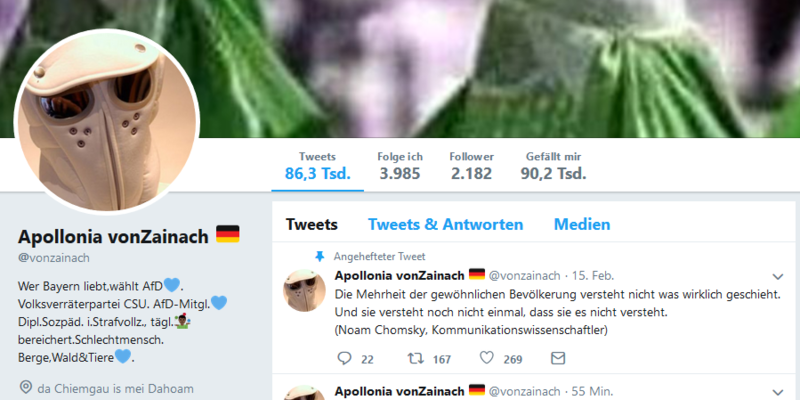 From the information we have gathered, it seems that the AfD-related Bavarian Twitter account with the highest activity is ‘Appollonia vonZainach’, which has tweeted over 88,000 times (05.09.2018); the account has only 2,000 followers. ‘Those who love Bavaria vote for AfD. CSU is the betrayer of the nation. AfD member. Certified social pedagogue. In prison, enriched on a daily basis. Bad human. Mountain, forests and animals’. In contrast, the ‘AfD-related account with the widest reach’ in general according to Tagesspiegel is @balleryna, which currently has 258,000 followers after having tweeted around 87,000 times. There may still be something fishy regarding those numbers. 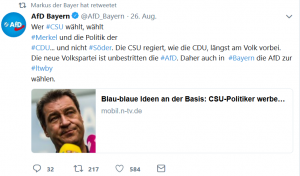 The comparison, however, suggests that the Bavarian AfD supporter accounts do not seem to have the aim of gaining as many followers as possible; their objective might rather be to increase the interaction rate of other AfD or AfD-related accounts. The highly active Twitter account ‘Michael’, for instance, shared 139 tweets about migration and refugee crimes on August 30 within only three hours. ‘Our country, culture and identity are at stake. Germany/supporter of Defend Europe/Europe of the Nations/TSV1860 München/Dog owner’. 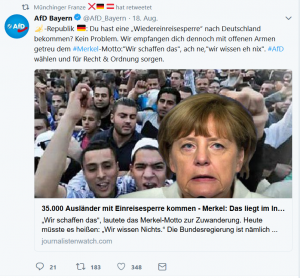 Such support activities indeed indicate the risk that some Twitter users are convinced to vote for AfD due to the alleged high popularity of AfD-related accounts. The scope of this influence, however, has not yet been scientifically proven. At this point, we find that the Bavarian AfD supporter accounts do not pursue a clear strategy for the Bavarian state parliament election. Even though they constantly retweet the content of official AfD or AfD-related accounts, these tweets do not have a specific focus on Bavarian issues but rather cover AfD topics relevant for Germany as a whole. We could not find networks mainly consisting of AfD supporter accounts with a focus on Bavaria. 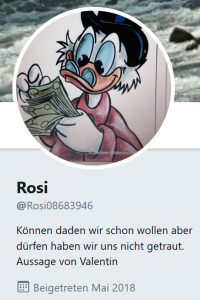 We will, of course, continue to keep an eye on the Twitter activities of Bavarian AfD supporter accounts during the weeks before the Bavarian state parliament election.